Empty Bowls is an international grassroots effort to fight hunger, personalized by artists and art organizations on a community level. The basic premise is simple: Potters, craftspeople, educators and others donate their time and talents to create handcrafted bowls. The community is then invited to a simple meal of soup and bread. In exchange for a cash donation, guests are invited to keep a bowl as a reminder of all the empty bowls in the world. One hundred percent of each meal’s proceeds are donated to local hunger-fighting organizations or charitable groups. It is the collective energy of all the people involved that has made Empty Bowls what it has become today. Events now take place across the United States and in at least a dozen other countries. Many millions of dollars have been raised and donated to hunger-fighting organizations – all on a local community level. 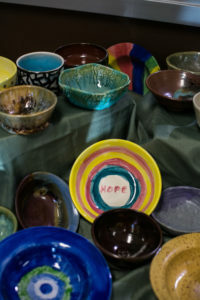 Each year Clayfolk members donate hundreds of bowls to Empty Bowl events in both Jackson and Josephine counties. Clayfolk members donate bowls at the end of the annual Clayfolk Show & Sale, as well as a call for donations is coordinated by our Clayfolk Empty Bowls committee chairs. Visit the Peace House website for this year’s event dates and details. This event brings people from Jackson County together for a common community purpose; a soup dinner and pottery sale fundraiser to help alleviate hunger and food scarcity in the Rogue Valley. Last year the collaboration of Ashland potters, elementary school, high school and S.O.U. student potters joined with Clayfolk and raised over $14,000 which was distributed to Uncle Food Diner, ACCESS and Food Angles. To donate bowls please contact the Clayfolk Jackson County Empty Bowls chair. Visit the Options website for this year’s event details. Attendees have the pleasure of selecting a bowl from hundreds of one-of-a-kind hand-crafted bowls donated by Grants Pass area artists and Options’ clients. To donate bowls please contact the Josephine County Empty Bowls chair. Founded by Lisa Blackburn and Art teacher John Hartom in 1990-91 when they joined a drive to raise charitable funds in his Michigan community. Hartom’s idea was to organize a charitable event to give artists and art students a way to make a personal difference. Hartom’s students made ceramic bowls in their high school art classes. The finished products were then used as individual serving pieces for a fund-raising meal of soup and bread. Contributing guests kept the empty bowl. During the next year, Hartom and other participants developed this concept into “Empty Bowls”. Visit the official Empty Bowls website.